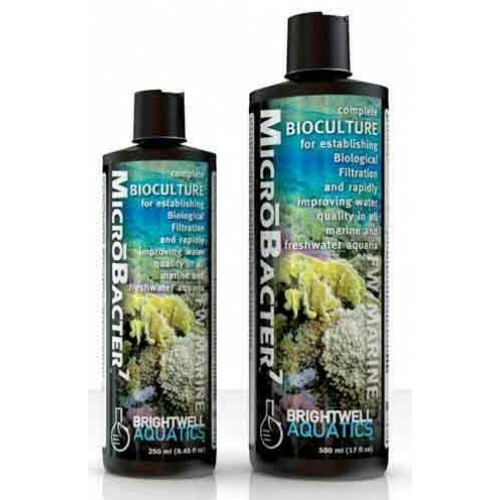 Brightwell Aquatics MicrōBacter7 is a selective complex of extremely effective microbes and enzymes that rapidly reduces the concentrations of organic nitrogen, ammonia, nitrite, nitrate, phosphate, and organic carbon in all marine and freshwater ecosystems, leading to greatly improved water quality; better water quality typically leads to healthier aquarium inhabitants. MicrōBacter7 does not require refrigeration; however storage in a cool, shaded area will prolong the activity, and maximize the shelf-life, of the product. Shake product well before using. Mix appropriate volume of MicrōBacter7 (see below) with 250-ml (~8 fl. oz.) of aquarium water in a clean container prior to addition to aquarium. If using a pipette to dispense MicrōBacter7 below water level of container or aquarium, be sure to thoroughly clean pipette with fresh water prior to placing tube back into MicrōBacter7 bottle; failure to do so will contaminate the product. Best results may be obtained by adding mixture to external biological filtration system (if applicable). Do not add to pump intake port(s). For best results, use within 1-year of purchase date. Grossly overdosing MicrōBacter7 will not significantly increase the effectiveness of the product, nor the rate at which it enacts changes in aquaria. The following recommendations are based upon extensive testing and will produce the best results in most aquaria. Medium- to High-nutrient Systems, or to seed Biological Filtration in new aquaria: To effectively decrease the concentration of available nutrients and waste material in all marine and freshwater aquaria, add 5 ml (1 capful) per 25 US-gallons (94.6 L) [≈4 drops per gallon (3.8 L)] of aquarium water daily for the first two weeks of use; the impact that MicrōBacter7 has on an aquarium is most evident within this period. Turn protein skimming and UV-sterilization off for a period of 4 hours following addition to aquaria. A noticeable difference in water clarity is typically apparent within 30-minutes of dosing. Follow same instructions for new aquarium start-up. Thereafter, switch to “low-nutrient” dosage (below). *The go-to bacteria choice for starting all pro-biotic reactors!! !